For over a decade, the Howard government has found ways to silence its critics, one by one. Like the proverbial frog in boiling water, Australians have become accustomed to repeated attacks on respected individuals and organisations. For a government which claims to support freedom of speech and freedom of choice, only certain kinds of speech and choices appear to be acceptable. Silencing Dissent uncovers the tactics used by John Howard and his colleagues to undermine dissenting and independent opinion. Bullying, intimidation, public denigration, threats of withdrawal of funding, personal harassment, increased government red tape and manipulation of the rules are all tools of trade for a government that wants to keep a lid on public debate. The victims are charities, academics, researchers, journalists, judges, public sector organisations, even parliament itself. 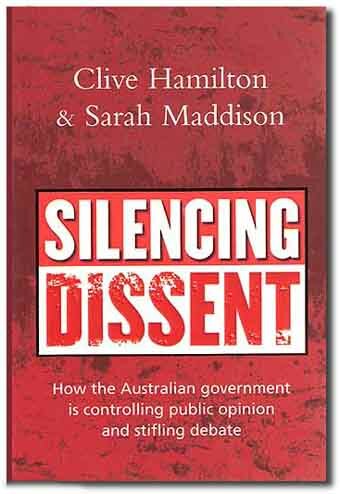 About the publication Clive Hamilton and Sarah Maddison, Silencing Dissent: How the Australian government is controlling public opinion and stifling debate (2006): This book is now out of stock, and we no longer supply it to our members or to the wider public. We suggest you could search for online new or second-hand bookshops to secure your copy. Over the past decade Australia has undergone a profound transformation, a kind of conservative-populist counter-revolution. The Howard Government has abandoned both the quest for reconciliation and the idea of multiculturalism. It has closed our borders to all those seeking refuge here by boat, by the use of military force. It has adopted a foreign policy of a more uncritically pro-American kind than was seen even in the era of Menzies. As part of that policy, alongside the Americans and the British, it has drawn Australia into the unlawful invasion of Iraq, which has predictably seen that country descend into the bloody chaos of sectarian civil war. It has turned its back on the first stage of the international fight against global warming, by refusing to sign the Kyoto Protocol. It has allowed the erosion of vital principles of our system of government - like the independence of the public service and the idea of ministerial responsibility. What has been puzzling about this process is the absence of powerful scrutiny of the drift of the nation, of a spirited, honest and intelligent debate. While Australia has been transformed, large parts of the nation have seemed to be asleep. In a book I edited in 2005, Do Not Disturb: Is the media failing Australia?, one possible answer to this puzzle was suggested -- the melancholy condition of the mainstream political media. In Silencing Dissent an even more alarming answer is provided -- namely, that since its election in 1996, the Howard Government and its faithful followers in the parliament and the media have pursued a partly-instinctive and partly-conscious policy of systematically silencing significant political dissent. It is at the heart of the argument of this book that there has been not one but many different ways in which this single objective has been pursued. Let me list some of the more important outlined here. In parliamentary inquiries government supporters have frequently showered expert witnesses of whom they disapprove with personal abuse. Scientists employed by government-funded agencies have been prohibited from communicating freely with the public on matters as serious as global warming. The independence of statutory authorities has been all but destroyed. The appointment of three of the country's most strident cultural warriors to the Board of the ABC was only the most conspicuous example of the Prime Minister's conduct of a 'long march' through all of the culturally sensitive institutions of society. This process was deepened by a parallel trend - the use of government patronage and the taxation system to silence the voices of the non-government organisations, fully ninety per cent of whom now believe that they risk losing government funding if they freely speak their minds. The government's obsessive and unhealthy desire for control has extended well beyond suborning previously independent institutions and taming NGOs. When inquiries into catastrophic policy failures are judged to be unavoidable, it has either appointed trusted insiders not likely to embarrass the government (Iraq) or so framed the terms of reference that a politically embarrassing finding can be ruled out in advance (AWB). The same government desire to close down potential sources of dissent has recently affected its relations with the Senate. As soon as the government had the numbers, it made clear that the era of embarrassing independent Senate inquiries was over. Even its willingness to cooperate fully with the invaluable estimates hearings began to unwind. Long before, the desire to silence critical voices at the highest levels of the public service had also been made clear. To teach every public servant a salutary lesson, Admiral David Shackleton (over the children overboard affair) and the head of the federal police Mick Keelty (over Iraq), were openly humiliated for speaking truthfully but out of turn. Under Howard, even behind closed doors, public servants have been obliged to forget earlier lessons about the virtue of fearlessness, and to learn new ones about the importance of not offering unwanted advice. Inside the public service a spirit of stifling conformity and an atmosphere of general intimidation have come to prevail. The health of a democracy relies on many different things: limited government; strong civil society; the independence of autonomous institutions; the encouragement of dissident opinion, wide-ranging debate. All these values are presently under threat. The Howard Government has become more intolerant of criticism and greedy for control the longer it has been in power. The evidence presented in this volume offers the most compelling case yet about the increasingly authoritarian trajectory of the political culture during the Howard years. In addition, it offers vital clues about why opposition to the government's counter-revolutionary transformation of the country, in so many different spheres of public life, has thus far proven to be so weak. For both these reasons Silencing Dissent is a timely, disturbing and unnerving book. Many welfare organisations have discovered that criticising policy is unacceptable to this Government, write Sarah Maddison and Clive Hamilton. A decade is a long time to be in government. Any government in power for so long will leave an indelible mark on the society it governs, changing the culture, identity, values and direction of the nation. For those in the community who disagree with government policy, there is some comfort in the knowledge that at the very least they can publicly express their dissenting opinions through the recognised institutions of democracy. This capacity for public debate and dissent ensures that governments must continue to publicly justify their decisions - a hallmark of democracy. But what happens when these democratic institutions are themselves eroded by government. What are the costs when a government tries to ensure that its values are the only values heard in public debate? What are the consequences for a nation whose citizenry is denied essential information about controversial policies? The Howard Government has been progressively dismantling the democratic processes that create the capacity for public debate and accommodate dissenting opinion. The tactics used to silence critics are diverse, including the withdrawal of government funding, threats to destroy the financial viability of dissenting organisations, appointment of party functionaries or friends to key positions, strict interpretation of laws governing release of information, and the targeting of individuals. One sector that has been a particular target of these efforts to silence dissent is the non-government sector. In Australia, recent years have seen an unprecedented attack upon non-government organisations (NGOs), most particularly upon those organisations that disagree with the Federal Government's views and values. The attacks have come both from the Government itself and from close allies such as the Institute of Public Affairs (IPA). Questions have been raised about NGOs' representativeness, their accountability, their financing, their charitable status and their standing as policy advocates in a liberal democracy such as Australia. The most public and visible attack on NGOs has been led by the IPA, a right-wing Melbourne think tank, which first came to prominence in the 1980s when, backed mainly by the mining industry, it was instrumental in developing and promoting the policies of economic rationalism. In the world view of the IPA, NGOs are seen as selfish and self-serving interest groups with little representative legitimacy. The vast store of knowledge of disadvantage and marginalisation held by NGOs such as the Red Cross, the Brotherhood of St Laurence, Oxfam and the Australian Conservation Foundation is dismissed. Instead, they are seen as a group of professional stirrers who are not really interested in the welfare of those they claim to represent, but want only to feather their own nests, keeping their salaries and building their power bases. The IPA has been particularly critical of the legitimacy of NGOs in the policymaking process and has urged the Federal Government to withdraw financial support from NGOs that engage in advocacy. It argues that NGOs often invent social and environmental problems and undermine the legitimacy of elected representatives in democratic states. There is an uncomfortable match between the IPA's campaign against NGOs and the known views of the Prime Minister, John Howard, and several of his parliamentary colleagues. Before Howard's election in 1996, he outlined his view that there is a "frustrated mainstream in Australia today which sees government decisions increasingly driven by the noisy, self-interested clamour of powerful vested interests with scant regard for the national interest". More recently, in an address to the Menzies Research Centre, he repeated his pledge not to govern "for the boutique interests of the few while ignoring the everyday concerns of the many". The Prime Minister's public views do not always match his Government's more covert behaviour. Other highly organised groups that are active in policy debates, notably business interests, escape the tests of "mainstream representativeness" demanded of NGOs, despite the fact they are clearly self-interested. We now know from doctoral research by Guy Pearse [a Liberal Party member and former speech-writer for then environment minister and senator, Robert Hill] that for a decade the Howard Government's climate change policies have been not so much influenced by but actually written by a tiny cabal of powerful fossil-fuel lobbyists, self-described as the "greenhouse mafia", representing the very corporations whose commercial interests would be affected by any move to reduce Australia's burgeoning greenhouse gas emissions. This group consists of the executive directors of a handful of industry associations in the coal, oil, cement, aluminium, mining and electricity industries. Almost all of these industry lobbyists have been plucked from the senior ranks of the Commonwealth public service, where they wrote briefs and cabinet submissions and advised ministers on energy policy. Cabinet deliberations, ministerial committees and preparation of cabinet submissions are meant to be confidential and beyond the reach of lobbyists, yet the greenhouse mafia has unrivalled access to internal government processes. As the existence of this lobby group demonstrates, the problem with NGOs is not influence per se, it is about who has influence and the sorts of values that inform their work. It is not NGOs as such that have been targeted but those NGOs that are seen to have an agenda that differs from that of the Government. Certain NGOs have been spared criticism and threats, however, and have been actively cultivated through increased public funding and the promotion of individuals to various government boards and bodies. While the World Wide Fund for Nature Australia appears to have had a close relationship with the Howard Government since the 1996 election, the events surrounding the enactment of the Environment Protection and Biodiversity Conservation Act (1999) were a turning point in this relationship. This act brought wide-ranging and controversial changes to Commonwealth environmental laws. The endorsements of the act provided by WWF Australia - joined by three other smaller groups - contrasted with the often scathing criticisms made by opponents of the legislation, including the Australian Conservation Foundation, the Wilderness Society and Greenpeace. After the legislation was enacted, people associated with WWF Australia and the other supportive groups were appointed to serve on Federal Government environmental advisory committees. WWF Australia was also awarded a contract to disseminate information about the act among environment NGOs. A report in 2004 concluded that WWF has enjoyed extensive financial support from the Howard Government, with a five-fold funding boost since 1996. Funding to other environment groups, notably ACF and the Wilderness Society, both of which were critical of the bill, has been slashed. A similar strategy of divide and rule has been applied in the welfare sector. Organisations that have been critical of the Government, such as the Australian Council of Social Service and the Brotherhood of St Laurence, have been frozen out of debates. Others that have been friendly to the Government have been favoured with funding, contracts and appointments of senior staff to various boards and inquiries. Two of the most favoured organisations have been the Salvation Army and Mission Australia. The rise in influence of the former chief executive of Mission Australia, Patrick McClure, who played a prominent role in debates concerning the introduction of the GST that was in some respects counter to the position of other major welfare groups, is a case in point. McClure was subsequently appointed to head the Government's review of the welfare system, which produced a report that became the blueprint for the Government's controversial approach to welfare reform, and is he now a member of the Government's Community Business Partnership. In 2004 the Australia Institute conducted a survey of Australian NGOs that include some advocacy in their role. Among other things, the survey explored their perceptions of government attitudes to debate, and whether they believed that dissenting views were welcomed or discouraged. The respondents expressed strong views about the the way in which governments, particularly the Howard Government, subdued their often-critical voices. They reported tactics including bullying, harassment, intimidation, public denigration, and the threatened withdrawal of funding. Sometimes these threats came directly from ministers or ministers' offices. Many commented on implicit pressure to censor themselves. In the words of three: "While not openly stated, it has been unequivocally conveyed that 'we do not fund organisations to criticise us'." Some make a conscious decision to avoid being compromised. As one wrote: "We don't take government funding so we can criticise them." And another: "To have no government funding is liberating." Ninety per cent of respondents believed that dissenting organisations risked having their funding cut. Three-quarters (74 per cent) believed that NGOs were being pressured to make their public statements conform with Government policy. Since 2003 the Government has escalated its attacks on the NGO sector through a range of strategies designed to restrict the advocacy capacity of the sector as a whole. In 2003, the Treasurer, Peter Costello, undertook to introduce a Charities Definition Bill that would disqualify charities that engaged in advocacy work, other than that which is ancillary and incidental to their main purpose. The threat was that lobbying or advocacy could result in the loss of an organisation's charitable tax status or status as a deductible gift recipient (DGR). As many foundations can only donate to organisations that have DGR status (which makes the tax-deductibility of donations possible), this could result in the indirect defunding of many such organisations. Although the Government subsequently abandoned most of the draft bill and retained the common law definition of charity, many NGOs remain concerned that there will be a crackdown on their charitable status. These fears were strengthened by a draft tax ruling released in May 2005 in which the Australian Taxation Office stated "political and lobbying purposes are not charitable. While such purposes may use educational means, this is not sufficient to show a charitable purpose", although the the Tax Office did allow that "political or lobbying activities that are merely incidental to a purpose that is otherwise charitable do not by themselves prevent that purpose being charitable". These continued attacks on the advocacy work of NGOs, along with the survey responses described above, paint a bleak picture of the state of public debate in Australia, suggesting a high degree of coercion on the part of Australian governments. The outcome for the broader Australian polity is that the knowledge and breadth of experience collected together in the NGO community is having much less influence on how we develop as a society than it should. Like individual citizens, community groups are being increasingly reluctant to engage in the democratic process because they no longer believe that they can make a difference. Certain influential business lobbies have been brought into the fold, along with a few tame or uncritical NGOs like Mission Australia, the Salvation Army and WWF. There are grounds for serious concern that the longer this continues the more difficult it will be to reshape and rebuild the structures of democratic participation. This is an edited extract from Silencing Dissent: How the Australian Government is Controlling Public Opinion and Stifling Debate. A collection of essays document how dissenting voices have been muted during the Howard years. David Marr is a Sydney Morning Herald journalist who publishes with Allen & Unwin. WHEN JOHN HOWARD became prime minister, he made sure the tactics he used so brilliantly to claw down his rivals would never be turned against his government. The great leaker would stop the leaks. White-anting would end. There would be zero tolerance for dissent within the party, the government and the bureaucracy. He came to office in 1996 with a list of people to be targeted and removed from universities, government authorities and the public service. In his first week, he sacked the heads of six departments. Those senior bureaucrats who survived Howard's purge were instructed in future to report all calls by journalists to the Prime Minister's press office. The new communications minister Richard Alston was soon lashing the ABC over budgets and bias. And the new men and women in power were deploying a new rhetoric of abuse against the critics they lumped together in a shadowy conspiracy called the left. Touted as a contest of values, this was really a party political assault on Australia's liberal culture. In the name of "balance" the Liberal Party agenda muscled its way into the intellectual life of the country. And the party had changed. This wasn't the vaguely patrician party of Malcolm Fraser. Small business had triumphed and brought to government the ethos of the corner shop. In Silencing Dissent, the unnamed head of an anonymous non-government organisation catches the new message from Canberra perfectly: "We do not fund organisations to criticise us." Ten years down the track, the editors of this fine collection of essays are taking stock. That the ground rules and language of public debate have changed enormously is not really in dispute. At issue is the extent of the damage done. Clive Hamilton and Sarah Maddison write: "The Howard Government's intolerance and silencing strategies are not confined to organisations that might be seen as its political enemies, but extend to all of the institutions that make up a democratic political system." They claim to find "an alarming decline in the health of Australian democracy over the last decade". Can it be so bad? The strength of Hamilton's work at the Australia Institute over the years has been to find solid ground on which to stand while arguing about the most elusive values. The challenge he faced here was to diagnose the health of democracy in this country without Silencing Dissent reading like a bunch of losers whingeing. So the essays catalogue the horror stories of the Howard years - academics bullied, the military silenced, leakers prosecuted, the Quadrant crowd sanctified - but the book is grounded on the considered verdicts of professionals in the business of public debate. Nearly every one of the 300 NGOs surveyed by the Australia Institute in 2004 believe their futures are on the line if they cross the Howard Government, with a minuscule 9 per cent thinking Canberra encourages public debate. These are organisations that lobby, consult and advise government. Their verdict, according to Hamilton and Maddison, is that John Howard's "federal government is perceived by NGOs as being especially intolerant of dissenting voices". Canberra journalists also spend their professional lives grappling with government and their verdict on the Howard years is as disturbing. Helen Ester, a Queensland academic and former Canberra journalist, interviewed 24 senior reporters in the parliamentary press gallery a couple of years ago. "The interviews," she writes, "paint a picture of cumulative deterioration in sources of political news and information, describing new layers of disempowerment, frustration and disinformation. Most interviewees noted that the Howard Government had ushered in a decade of unprecedented executive control over political communication." The wisest voices in Silencing Dissent remind us that 1996 wasn't year zero. Starving universities and bashing the ABC began under Labor. Legislation ending the lofty rule of the Canberra mandarins was passed by Labor. Ministerial staffers first materialised under Whitlam. Labor governments have never legislated to protect whistleblowers. The political skew of the intelligence services goes back to the Cold War. Stacking government boards with cronies is older than Methuselah. So why have things grown exponentially worse under Howard? Keep Silencing Dissent within reach, and you'll never be at a loss for the telling detail of reports repressed, parliamentary traditions ignored, talent overlooked, organisations brought to heel and whistleblowers punished. But the essays collected here don't really ask the deeper questions that might clarify why this particular government has pursued so successfully what Robert Manne calls "a partly-instinctive and partly-conscious policy of systematically silencing significant political dissent". Nor does Silencing Dissent acknowledge the victories. Almost without seeming to, the collection maps the limits of the government's capacity to suppress. After the public fiasco of Education Minister Brendan Nelson personally culling academic research projects - with help from Quadrant editor Paddy McGuinness - the process seems, once more, to be back in the hands of independent experts. And though they had to give their jobs away to do so, Mike Scrafton nailed the Prime Minister's lies about kids overboard, while intelligence analysts Rod Barton and Andrew Wilkie exposed the deceit of the government's case for the invasion of Iraq. The trouble is, the nation seems to care little about the successes or the failures in Canberra's long war against information. "While Australia has been transformed," Manne writes, "large parts of the nation have seemed to be asleep." Perhaps the nation is waking up as the Howard years draw to a close. Silencing Dissent is the knock at the door, the alarm clock ringing, the handful of gravel thrown at the window. If we keep on snoring, we have only ourselves to blame. John Howard promised more open government but his years in power have brought an unrelenting attempt to control information and views. Michelle Grattan is The Age's political editor. LABOR'S KEVIN RUDD will no doubt assure us, as he seeks our votes, that if he is elected, government will be more open, transparent and accountable, and the public service treated more respectfully. All the sort of things John Howard pledged before the 1996 election. Such promises might or might not be honoured by a Rudd government. They certainly weren't by the Howard one. A few months after he won power, the new prime minister was celebrating that the "pall of censorship" had been lifted - people could speak out more freely without being labelled bigot or racist. If so, one curtain was soon replaced by another, and the new jibe was to label those you wanted to denigrate as from the "elites". The Howard years have seen an unrelenting attempt to control information, curb irritant views, reward and advance political friends, and hobble those considered not one of "us". Silencing Dissent documents the process, inside and outside government - in public service and statutory authorities, media, universities and the research community, non-government organisations, the intelligence community, and, since the Government won a majority there, the Senate. The book's thesis is that "the apparently unconnected phenomena of attacks on non-government organisations, the politicisation of the public service, the stacking of statutory authorities, increasing restrictions on academic freedom and control over universities, the gagging or manipulation of some sections of the media, and the politicisation of the military and intelligence services form a pattern that poses a grave threat to the state of democracy in Australia". The Government has been ruthless in its methods, assiduous in its reach. Senior and respected individuals have been hauled into line like errant schoolboys and made to issue "clarifying" statements when what they've said has embarrassed the Government (such as then-Navy chief Vice-Admiral David Shackleton about children overboard). Historian Stuart Macintyre documents how as education minister, Brendan Nelson butted into the research grant process. Emeritus professor of science Ian Lowe examines the ideological intervention in that field, concluding the Government "is increasingly using science . . . as a drunk uses a lamppost - for support rather than for illumination". Journalist Geoffrey Barker captures the attitude towards the public service when he recounts the comment of one former secretary: previous incoming governments had said "Don't be against us", but this one asked, "Are you one of us?" While there's been quite a lot of discussion about the public service, the fate of statutory authorities has been less noticed - with the exception of the ABC. Andrew Macintosh from the Australia Institute documents the Government's two-pronged approach: board stacking and the stripping back of the powers and independence of these bodies. Macintosh suggests an independent body regulate appointments instead, as in Britain. Andrew Wilkie, who resigned from the Office of National Assessments in March 2003 "over the Government's deceitful case for the invasion of Iraq", has had personal experience of what can happen to those who blow the whistle. The Government demonised him, including by leaking highly classified material, which is a criminal offence (no one was caught). Wilkie is sceptical about the possibility of change.. "One might hope that the military and intelligence services will automatically de-politicise somewhat with the next change of government. More likely, such a change will do little more than regenerate the existing problem . . . The Labor Party is, after all, probably no less likely than the Coalition these days to try and skew the security agencies in their favour by adjusting senior appointments and playing to people's timidity and obsequiousness." In the end, governments are mostly the same - when it comes to control, they'll do what they can get away with. If things seem to have progressively got worse, it may be because they've also got bigger and more efficient - for instance, technology and increased staff numbers make it easier to swamp the media market with your message. The book closes with a brief cheer-up chapter. Editors Clive Hamilton and Sarah Maddison highlight some "signs of resistance" - the brave souls who buck the trend. Some rebels are on the Government backbench, which is now militant and outspoken. Then there is Defence chief Angus Houston who publicly took issue with the account given by his minister, Brendan Nelson, of what Nelson was told about the Kovco affair. This is a book with attitude - lots. Clive Hamilton heads the left-leaning Australia Institute. It makes its argument robustly, giving little quarter to any other side. But even if there is some exaggeration, the case its contributors build is scary. Those in the media who observe the control mechanisms up close can attest to their power. But there are indications the Government might have overreached, as happens when power goes to political heads. Of all the great Australian pastimes, silence is currently the most popular. This is largely due to a fear of speaking out, described in a rare book, Silencing Dissent, by Clive Hamilton and Sarah Maddison. The authors' fellow Australian academics and writers say little if anything publicly that might upset the all-controlling Bushites of John Howard's government and its inspectorate in the media. Trial by media of Australia's domestic victims, be they Aboriginal or Muslim, is standard practice. Officially approved platitudes pass as news and commentary, along with weary stereotypes of much of humanity, from heroic Aussie cricketers to whingeing Poms and mad mullahs. True Australian heroes go unrecognised, such as Arthur Murray, a former Aboriginal union organiser who has fought unremittingly for 25 years for justice for his son Eddie, killed in police custody, and for all his people. Few white Australians will have heard of Arthur, whose dignity and courage evoke a secret history, described by the historian Henry Reynolds as the "embarrassment of bloodied billabongs". Silencing Dissent is an appropriate book for an appropriate era. At a time of increasing cultural homogeneity, collective apathy and lack of community participation in Australia, this book examines how for over ten years, John Howard's conservative Liberal-Coalition government has employed intimidation, deceit, obfuscation and conspiracy to silence and ridicule those who seek to dissent its policies. Silencing Dissent reveals how our Australian democratic institutions, both government and NGOs are being eroded. The very heart of public participation has defected - and this book shows how and why. In John Howard's Australia in 2007, by contributing to the book - each Silencing Dissent contributor is a radical dissident. The editors - well respected authors Clive Hamilton (executive director of lefty think-tank, The Australia Institute) & Sarah Maddison (lecturer in Politics and International Relations at the University of NSW) - and its 8 contributors have produced an entirely current and highly readable dire warning of a deadening Aussie democracy. Currently a stacked Senate weakened by coalition reform is buckling under the boot of Mr Howard. The book examines a multitude of cases, all of which highlight Howard's master plan to systematically overthrow the authority of experts and individuals across the nation - in order to control public opinion and rewrite Australian history under the Liberal Party's grand vision. Academics, critics, public servants, social justice seekers and even members if its own Party are targeted and silenced galore - effectively dismantling the crucial checks and balances of government accountability and "weeding out those who are not sufficiently compliant". However Silencing Dissent also shows how those who toe the party line are sufficiently rewarded for their loyalty. Citing obvious issues from as far back as 1996 (Refugees; Sadam's WMDs; the invasion of Iraq; the $300 million AWB scandal; the Tampa incident; the children overboard debacle; the gagging and guillotining to force through controversial legislative change) as obvious cases, the book delivers myriad evidence of an active hardline government intent on gagging critics of its neo-conservative rule. Silencing Dissent offers countless examples of how "the actions of the Howard Government have put democracy at risk". Unable to tolerate 'frank and fearless' bi-partisan advice from public servants, NGOs and other highly reputable people, many boards and committees have been dissolved by an ideologically-driven government. Organisations are muted, quashed and conveniently populated with Howard's sycophantic political allies (as in the ABC). Indeed those who are submissive go on to receive obvious rewards, awards and accolades for their subjugated loyalty. s Silencing Dissent describes clearly and concisely how, under the Howard regime, only certain kinds of speech appear to be acceptable. This book unveils the methods utilised by Howard and his colluders in the ongoing corrosion of democratic dissent. A timely collection of essays written by ten leading social justice experts, academics, thinkers, 'do-gooders' and whistle-blowers, Silencing Dissent will certainly be the target of an "inner circle of ideological warriors"; this "syndicate of right-wing commentators who receive favour from the Howard government". The likes of which determine the climate of public debate - which has arguably shifted a "long way to the right" over the past two decades. The book, published in February 2007, at the precipice of an election year, details a litany of intimidation, public vituperation, funding cuts, provocation, increased bureaucracy, covert and overt manipulation, outright refusal to adhere to the appropriate tools of accountability etc etc. And the sufferers under the Howard years are people, institutions, charities, academics, researchers, journalists, judges, public sector organisations - even defence force personnel. This poignant group of articles shows how since 1996, Howard has managed with much success to stifle critique of his policy and the manner of its implementation in this country. Silencing Dissent describes in detail how our media and public institutions are shaped, abused and dismantled in the pursuit of an ideological dominance. All brave democratic Australians need to consume this book. Read it. Steal it if you have to. Make a noise. DISSENT! Challenging the Government's version of democracy requires broad discussion, writes Patrick Allington. Patrick Allington has a masters degree in politics and is fiction editor of the new literary journal Etchings. AN early election-year salvo, this book offers succour to "Howard haters": editors Clive Hamilton and Sarah Maddison argue that during its decade in power, the federal Coalition has systematically dismantled democratic processes, stymied open and diverse debate and avoided making itself accountable to parliament or the community. Dissenters, even of the non-threatening variety, have found themselves sidelined, intimidated or publicly attacked, including via parliamentary privilege. All of this, Maddison states, reflects not merely a government enforcing its particular version of democracy but amounts to a serious deterioration of Australia's democratic health. She advocates instead "a more participatory, deliberative, embracing democracy that values dissent and debate, and that conceives of its citizens as capable and concerned to engage in political practice". Ultimately, scientist Ian Loweadds, "impoverished" public debate leadsto "policy directions that are not in the national interest". Silencing Dissent largely consists of a series of chapters offering thematic critiques of the Government's approach to leadership. Some writers, such as Lowe and former intelligence analyst Andrew Wilkie, have their own stories to tell. In combination, these chapters amount to a compilation of evidence condemning the Government's attitudes and actions with regards to universities and researchers, non-government organisations, the media, public service, statutory authorities, national security and the Senate. As the complaints pile up, a few are unconvincing and others are open to alternative interpretations. There is also a tendency to equate all pro-conservative commentary with anti-democratic intent. But mostly the specific examples offered are plausible. The children overboard saga gets another airing. In retrospect so brazen as to be comic, it is also a glaring example of one of the most deleterious developments detailed here, the proliferation of ministerial and media advisers. As journalist Geoffrey Barker writes: "Advisers occupy key positions as ministerial minders, gatekeepers and enforcers, ensuring that public servants know what ministers want and give it to them. But they are entirely unaccountable to parliament, and are subject to no legislative norms of conduct. Some advisers seem to have the specific role of keeping certain information away from their ministers so that the ministers can evade responsibility, claiming that they were not told and did not know about matters that might prove damaging to government." Equally alarming is the relentless and nuanced account provided by Harry Evans, the clerk of the Senate, of the neutering of the upper house's usefulness following the 2004 election. But a presumably unintended paradox emerges from the cumulative picture painted in Silencing Dissent. It exposes a government sometimes behaving badly but also governing badly, failing its core constituency. Despite being all-conquering, despite a decade in power and control of the Senate, the Coalition appears frail, so certain of the paucity of its legislative program and its policies, so bereft of vision, that it must hide behind elaborate facades and lay siege to even its most constructive critics. In turn, the book's singular focus on the federal Government's sins allows only glimpses of a broader picture. Federal Labor's ineptness is occasionally noted but a more detailed assessment of an Opposition incapable of holding the Government to account - not to mention an ALP that when in office enacted many of the procedural and legislative changes that the Coalition has exploited to excess - would have added a rich contextual layer. Maddison links the disengagement of John Howard's silent majority to the promotion of self-interest as a virtue, compounded by a restricted flow of information and a fear of speaking out. Her discussion is insightful but maddeningly slim. Silencing Dissent has plenty of examples of individuals and organisations that have attempted to resist the Government, but too few examples of those many more Australians whose apparent passivity, apathy or apolitical tendencies - leaving aside those who simply support the Government - has emboldened the Coalition. In this context, dissent becomes a complex thing, not least because the occasional dissident can offer a comforting protest-by-proxy role to troubled citizens: "I'm disgusted by Iraq but thank goodness for Andrew Wilkie." The sharp focus on the Government means other factors are briefly or tangentially considered. Perhaps most notable is the PR virus spreading not only across politics, both federal and state, but also through the media and into the community, such that the public expectation of political debate has altered dramatically. This is exemplified by public figures avoiding speaking with candour or complexity, and is compounded by an obsession with unity within political parties. While Silencing Dissent condemns dumbed-down politics, it occasionally falls victim to assuming an unsophisticated audience. There are legitimate complaints against the Howard Government in this book, which demands a wide readership, but would have been even more persuasive, and less likely to divide readers along existing partisan lines, if it had made a more comprehensive effort to incorporate into its discussion a broader vista of contemporary Australian society.